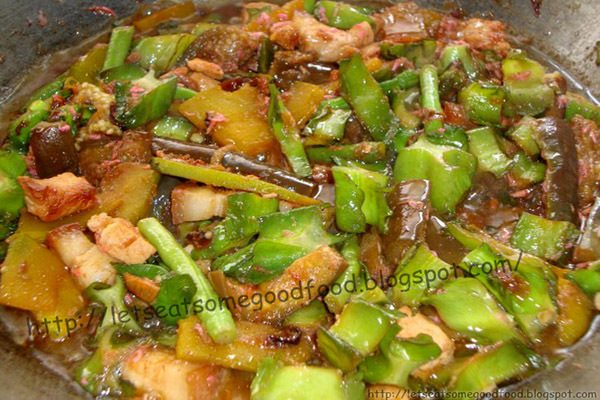 Pakbet Recipe (Pinakbet or Shrimp Paste Vegetable Stew) – Eats Yummy! Pakbet or Pinakbet is one of the best authentic Filipino recipes you will ever taste. Pakbet recipe is an easy dish that has many variants across the Philippines. A very popular one is the Ilocano’s Dinengdeng, which has saluyot as one of the ingredients, making it a bit slimy. Pinakbet recipe is so simple to cook that is why it is a common viand of typical Filipinos. Most Filipinos, young and old, surely have tasted it and knows it. You can also see it served in both fancy and typical Filipino restaurants across the country. In cooking this vegetable stew recipe, you may use either bagoong alamang (shrimp paste) or isda (fish paste / salted anchovy paste) and you can also add some more vegetables of your choice in this food recipe. If you have extra shrimp paste, you can also use it in cooking a recipe for Bicol Express, another recipe that complements our featured vegetable stew recipe. Pakbet recipe includes different vegetables such as ampalaya (bitter melon), talong (eggplant), kalabasa (squash), okra (lady fingers), sigarilyas (winged bean) and sitaw (string beans). Make sure that you pick and use fresh vegetables that you can find in the supermarket, vegetable market or wet market to enjoy the sumptuous mixed taste of the ingredients. It is not recommended to use vegetables you have stocked in the fridge for days. When preparing and cooking Filipino vegetable recipes or any vegetable recipe, tend not to overcook it. Vegetables are better half cooked. With the way we cooked it, we put more water on it as we love having more soup than the dry one. (Just a disclosure as we had someone criticized our photo for being watery. (“,) ) It is so tasty that you would want to pour more in your rice. Speaking of which, do not forget to cook your rice ahead and add some extra scoops are you will surely eat a lot with this recipe. Another dish that you may want to try to cook and eat with less guilt is tokwat baboy recipe. In a cooking pan, heat oil and fry the pork until brown, remove the pork from the pan and set aside. On the same pan, saute garlic, onion, ginger, and tomatoes. In a casserole, boil water and add bagoong. Add the pork in the casserole and mix with the sautéed garlic, onion, ginger and tomatoes. Bring to a boil and simmer for 10 minutes. Finally, add in all the vegetables and cook until the vegetables are done, careful not to overcook. Try to cook easy home cooking recipes like this and share your experience with us. Feel free to share our Pakbet recipe should you find it helpful and have your friends cook such at home with ease as well. Let us know your thoughts about this easy food recipe by commenting below, we would be glad to hear from you.